【STYLISH DESIGN】: Two high-quality zipper pockets & ribbed cuffs, Asymmetric hem & two bars printing on sleeve, Zipper closure, Drawstring hood, Urban hipster hip hop street casual style. 【CLOTHING MATCH】: This mens fashion hoodies is easy to layer with a casual t shirt, you can also mix and match it with so many stylish denim pants or casual pants for the daily look. 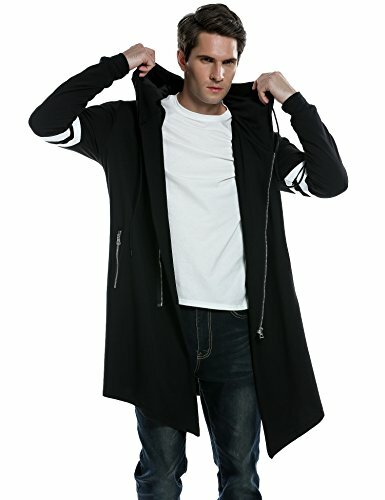 【Occasion】: Fashion long sleeve hooded cape great for all seasons, suits for Casual, Fashion, Hip Hop, Streetwear, Parties, Night club, Skateboard, Urban style, etc. 【Easy to Wash】: Machine washable. 【Size Suggestion】: Loose fit long hooded cardigan, please check product description before ordering to ensure accurate fitting.